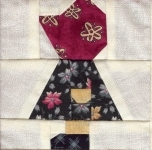 Here's a paper-pieced version of the classic Sunbonnet Sue pieced block. Finished size of the pattern is 4 inches x 4 inches. Pattern sheets are provided for both left and right facing Sunbonnet Sues. For more information on how to paper-piece, see our How to Paper-Piece" article. Click here to open the Sunbonnet Sue, facing left, pattern as a printable PDF file. Right click to download the PDF file. Click here to open the Sunbonnet Sue, facing right, pattern as a printable PDF file. Right click to download the PDF file. All contents copyright © 2004, Shelly Hazard, Sherry Tuxbury. All rights reserved.